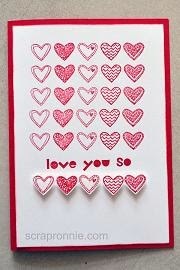 I *heart* these heart stamps!! So stinking cute! Materials: Language of Love stamp set (133074), Geometrical stamp set (133158), Real Red (106578) and Whisper White (106549) cardstock, Real Red ink (126949) and Small Heart punch (117193).